How Do You Spell GRAPE? 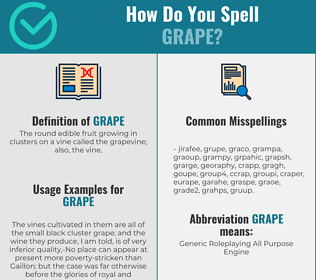 Correct spelling for the English word "grape" is [ɡ_ɹ_ˈeɪ_p], [ɡɹˈe͡ɪp], [ɡɹˈe‍ɪp]] (IPA phonetic alphabet). Below is the list of 232 misspellings for the word "grape". The round edible fruit growing in clusters on a vine called the grapevine; also, the vine. What does grape stand for?